Yusef Lateef, 93, the saxophonist, multi-reed player and flutist, died on Dec. 23. He had been a Local 802 member since 1960. Below, jazz writer Peter Zimmerman remembers Lateef’s versatility, which was really beyond category. 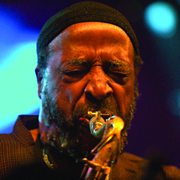 He won his only Grammy in the New Age category, for “Yusef Lateef’s Little Symphony,” which Billboard described as “an atmospheric four-movement classical/jazz composition.” On the album, Dr. Lateef played all the instruments, including tenor sax, alto, tenor and soprano flutes, water drums, gourd, kalangu, casio, sitar, shannie, and Ensoniq Mirage, a sampler-synth. However you want to label him, few would dispute that many of Dr. Lateef’s albums from the late 1950s and 60s – dozens of them, including “The Golden Flute” – could be categorized as jazz. And this is not to mention his work with the seminal Dizzy Gillespie big band of the late 1940s (allegedly, that’s his solo on “Hey Pete! Let’s Eat More Meat”). Dr. Lateef was a 2010 recipient of the National Endowment for the Arts award. Herb Boyd’s biography of him, called “The Gentle Giant” (his nickname), was published in 2006. Mr. Lateef is survived by his wife, Ayesha; a son, Yusef; a granddaughter; and several great-grandchildren.